Flicks is an all-in-one, Bluetooth enabled boombox that marries a high-fidelity audio system with a cutting edge 720p HD LED projector. Stream your favorite tunes from your smartphone or watch movies via HDMI from your smartphone or media devices like Roku, Google Chromecast, Amazon FireTV Stick and more. Flicks Ultra Throw lens displays an amazing 100-inch image at just over 8 feet away, plus you can do it all for hours thanks to Flicks massive battery capacity. Flicks beautiful design travels easily from the kitchen, to the pool, to a campsite, wherever you need a boost of ultimate FUN! Our goal is to design the perfect boombox projector for both work and entertainment use, giving priority to the battery just makes sense. 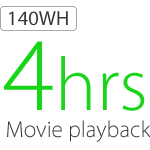 Taking advantage of Dashbon's power-efficient optical architecture and massive battery, the 140WH model Flicks gets up to 4 hours of movie playtime on a single charge and the 280WH model lasts up to a staggering 8 hours. The Bluetooth music playtime is even more impressive: 140HW model lasts up to 28 hours between charges and the 280WH model lasts up to 56 hours of continuous Bluetooth music playback. Flicks gives you the power and portability you need to enjoy a world of entertainment without ever looking for a power outlet during your camping trip. Show off your moves. Anywhere. When it comes to entertainment, bigger and louder are always better. Flicks is designed and engineered to deliver big and astounding image quality and unrivaled acoustic performance in an innovative, all-in-one design that can be powered by the built-in rechargeable battery for true portability and an amazing viewing and uncompromising listening experience anywhere. Advanced Texas Instruments DLP technology. Millions of mirrors working in sync. When designing the optical engine, we selected Texas Instruments latest DLP technology, which is an array of millions of individually controlled, highly reflective digital micromirror device (DMD) allowing us to perform high speed, efficient, and reliable spatial light modulation. The power-draining legacy UHP mercury vapor lamp was discarded in favor of energy-efficient LED as the light source. Full-color RGB LEDs deliver astonishing image quality with superior color saturation and amazing brightness. The projection lens was re-imagined and designed with ease-of-use in mind. We used a combination of plastic aspheric and glass spheric lenses to create beautiful images with razor-sharp details and capable of supporting Ultra Throw and displaying an amazing 100-inch image at just over eight feet from the wall. Cook alongside your favorite chef’s latest recipe in your kitchen. 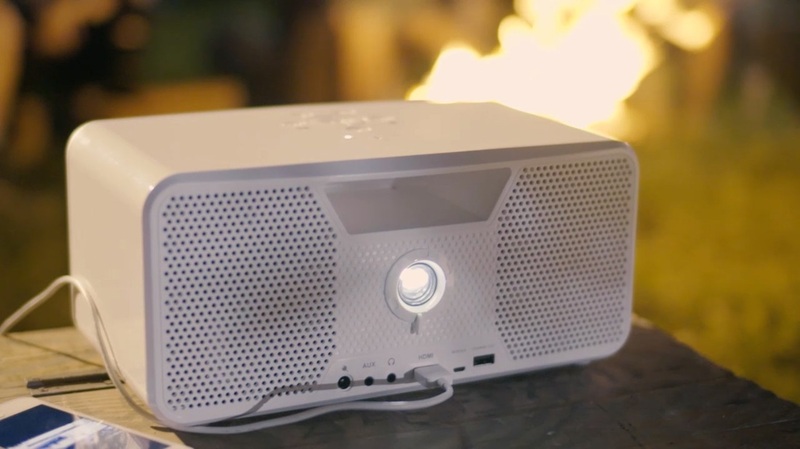 Watch your favorite movies by the campfire with your friends. 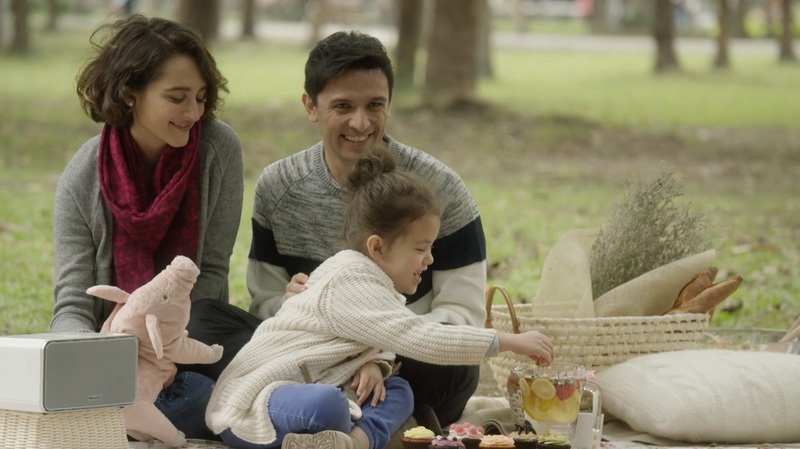 Gather the family and share that home movies, photos, and music in your backyard. 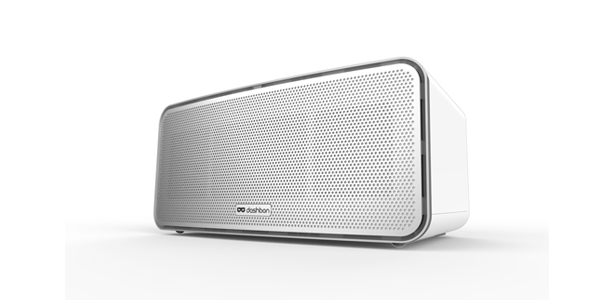 With Dashbon Flicks, your favorite stuff never look and sound so good. 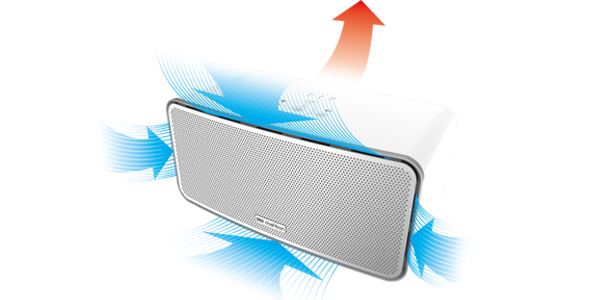 We engineered a new projector cooling system that draws in cool air from the sides of the front grille, passes through the center of the device while absorbing heat and carries the heat out in the back. So, there are no unsightly exhaust vents on the outside, and the vents are practically invisible. Not only Flicks projector works perfectly in an elegant and efficient fashion but also looks stunningly beautiful from any angle. Flicks has been designed to deliver uncompromising sound quality and optimal audio performance. Its unique design features an airtight enclosure that includes two custom designed neodymium speakers with wide dynamic range and a subwoofer with bass radiator system to create amazing sound clarity with crystal-clear highs and heart-pounding bass at any volume. One cable. All things entertaining. All it takes is one HDMI cable to watch movies and TV shows from your smartphone on Flicks. It couldn’t be simpler. To set up Flicks, switch on Flicks and connect your smartphone to Flicks using the HDMI cable. Since everything streams to Flicks via HDMI, that’s all you need to do to start enjoying movies and TV shows from your smartphones in brilliant HD. Roku. Chromecast. Amazon FireTV Stick. Take out your favorite streaming media device – Roku Streaming Stick, Google Chromecast, or Amazon Fire TV Stick – and connect it to Flicks built-in HDMI port. To power your streaming stick, just plug the USB cable to Flicks’ USB charge-out port. Take advantage of Flicks big built-in battery, sit back and enjoy a world of entertainment for hours in brilliant HD. Flicks is designed to be compact and portable. Grab the built-in handle to take your movies and music to places you never think possible. Flicks features a revolutionary and intuitive eight-button layout design with individual switches for the projector and the speaker and sound source selection. Controlling your video and music is just a button away. Flicks is the best projector to share and present your ideas to your colleagues and bosses. There are no convoluted setup process or bulky cables to deal with or wall outlet to look for. Plug in the HDMI cable and dazzle your audience with beautiful images and powerful sound for hours, all the while running on battery. Your presentations never look and sound this good. It’s so brilliant, you’ll never want to loan out Flicks. Dashbon Flicks has a built-in microphone to pick up your voice in crystal-clear clarity. So, use Dashbon Flicks as a speakerphone to take calls from your friends or make conference calls with your colleagues at the office. We think about what goes into delivering dazzling videos and lifelike sound so you don’t have to. Every time you connect your smartphone to Flicks to watch a movie or listen to music, the image chip and audio processor work with the optical engine and speaker to make adjustments automatically and deliver true-to-life images and high-fidelity sound. So you just concentrate on which movie you’re going to watch and let Flicks do the rest. Copyright © 2016 Dashbon, Inc. All rights reserved.